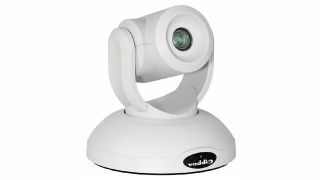 The What: Vaddio has begun shipping the RoboSHOT 40 UHD, a broadcast-quality PTZ camera with 40x zoom, genlock capabilities, smooth motor movement, and UHD imaging. The What Else: The RoboSHOT 40 UHD was designed with a genlock external sync port to provide accurate synchronization in multi-camera broadcast environments, plus phase compensation to fine-tune and adjust the genlock signal. The RoboSHOT 40 UHD is driven by Vaddio’s next-generation silent motor and tri-synchronous motion algorithms, which eliminates jitter or bouncing even at full zoom. Other features include 70.2-degree horizontal field of view (wide) to 4.1-degree (tele), simultaneous IP streaming (RTSP/RTMP format with H.264 compression) up to 1080p30, remote management, and flexible mounting options. RoboSHOT 40 UHD is available in black or white models. The Bottom Line: The 1/2.5 Type Exmor R CMOS Sensor offers powerful image signal processing, which means better light gathering capability, better contrast, and sharp 4K video even in complex lighting locations. High intensity spotlights often used in live events do not create problems other cameras can experience.